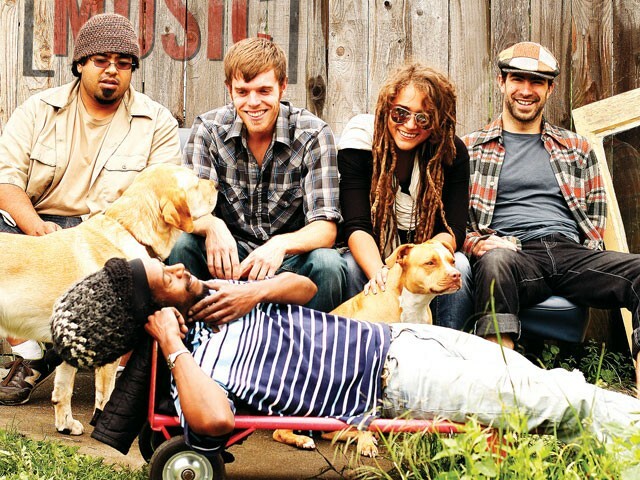 Real Life Rockaz are the Spokane reggae scene. On a relatively rain-moistened Sunday night in Spokane, the Blue Spark is packed with a diverse array of people. A vague aroma of marijuana hangs in the air outside, though it is paid no mind by most. Inside, the stage overflows with equipment and the various local musicians who comprise Real Life Rockaz. Paul Flores, who DJs as Pancho P and oversees Reggae Night every Wednesday at the Blue Spark, is excited about what’s happening with reggae in Spokane. Like Flores, John “DJ Yochanan” Gardner has long been a robust force in the region. Members of the Groove Patrol, Son Dulce and other area groups populate the Real Life collective, and their live presence is further solidified by a few secret weapons. The hypnotic, soulful vocals of songwriter Olivia Kintzele define their stage presence, and a somewhat unsung local hero, percussionist/producer Juan Parris, holds it down in world-class fashion on drums. Parris, who has been an active musician since he was a child, is originally from St. Kitts and Nevis, part of the Leeward Islands in the Caribbean and the smallest sovereign nation in the Americas. Eventually finding his way to our humble metropolis with his wife and children, Parris has appreciated performing music here as much as anywhere, steadily playing shows with Real Life Rockaz and, on occasion, Mick Croon and the Players, Raggs and Bush Doktor and Skillet Jones. He also often tours the world as the drummer for legendary reggae singer Mishka (Parris recently appeared with Mishka on the late-night television programs Jimmy Kimmel Live and The Late Late Show With Craig Ferguson). Real Life Rockaz play at the Blue Spark on Wednesday nights at 10 pm. Tickets: $3. 21 . Call 838-5787.